The actor passed away in late 2013 and several scenes had to be done in the next film in the franchise, but thanks to computer graphics capabilities your character should not be excluded from the plot . Although many twist his nose and say that " Fast & Furious " became a slot machine without grace and infinite sequences , the commotion was world when in November 2013 surfaced the news that Paul Walker had died in an accident . The next film in the franchise was already in production when the tragedy occurred , but the actor had only been part of his scenes .Naturally, the first thing you think is that Universal Pictures would eliminate the character of Walker , inventing the weft some excuse about his departure . However , there is overwhelming rumors that the studio will maintain the presence of ex -cop Brian O'Conner in history using imaging technology as a resource .The site Confidenti @ l - the respected news portal Daily News - says he has an informant following the production closely and he says they were hired four actors with very similar to Paul Walker physicist to be used as a basis for moving character .Walker 's face would be inserted in these stunts through CGI and voice generated from digital tools . 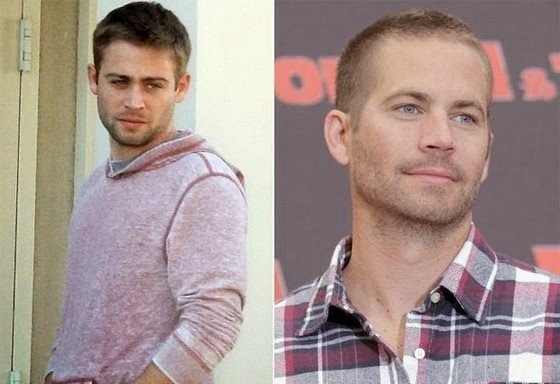 Earlier rumors said that one of the four stunts was hired Cody Walker , younger brother - and lookalike - the actor , but this was not confirmed by the informant. The artifice of inserting actors digitally , but it has not been executed flawlessly - or unnoticeable - until now, is nothing new in Hollywood . The trend , which started about 12 years ago with blockbusters like " Spider-Man " , " The Lord of the Rings : The Two Towers ," " Hulk " ( Ang Lee ) and "The Matrix Reloaded " , began as a proposal more modest than just risked creating stuntmen and extras in elaborate more open or nonexistent , impossible creatures to depict through makeup plans . Later , in 2009 , a bolder step was taken in the prologue to " The Terminator " director McG . The production made ​​use of body doubles and CGI to play the T -800 cyborg originally played by Arnold Schwarzenegger , with the same appearance of the actor in the first film in the series , released in 1984 . The feature still evident, was praised by many critics as the single point that has generated enthusiasm in the film - which eventually getting tough reviews on its debut . Practice makes perfect Since then, technology has advanced a lot and some animations, such as holographic projection of late rapper Tupac Shakur at the Coachella festival, now have the power to cause the public feeling of strangeness, making it difficult to distinguish what is CG and what is reality. A good example of this is the hype of British Galaxy chocolate, in which the actress Audrey Hepburn in "Breakfast at Tiffany's", was digitally revived and rejuvenated to act in a commercial. The reproduction of the appearance and movement of the actress were cause for widespread blot, due to its perfection in details. Of course this came at the cost of much work: one minute animation took a year to complete. However , the topic has generated debate in the entertainment industry . Questions about how far you can take the use of these resources without hurting image rights or offend relatives of the deceased are emerging and asking the drafting of new legislation covering the subject . Anyway , it's good practice to regularize come soon , because with the development of the technique , since a lot of people out there wanting to use it for various projects . The case of Paul Walker is not the only one that recently reverberated raising the discussion . Phillip Seymour Hoffman , who died early last month , was also working on a franchise film . With only a week to finish filming her scenes in the series " The Hunger Games " , Hoffman had a sizable role in the film . The solution found by the studio to fill his absence shall be the same as " Fast & Furious " : invoke the actor from the dead through the computer . Paul Walker died on November 30, 2013 as a result of traumatic injuries and burns after a car accident. He was 40 years old and died during a charity event I attended. Interrupted since the tragedy, the production of "Fast & Furious 7" will resume next month. The film had its release postponed to April 10, 2015.